With autumn stepping closer by the minute its time to shift the focus to indoors. I thought I might yabber about fireplaces this morning if you’re lucky enough to have one that is, and how to style them up. 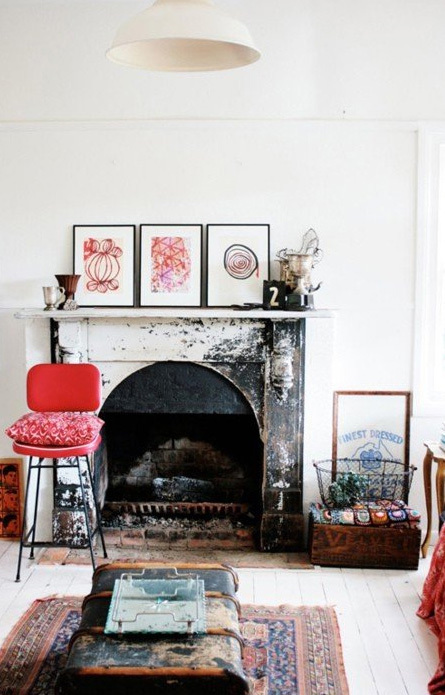 I am obsessed with fireplaces – the only major requirement I had when looking for a rental when we lived in the States and also then moving back and buying here was working fireplaces. A fire in grate gently crackling away with a cup of Gwynethâs ginger tea – nothing better I say. But how to style them up to make them look cool? You can go two ways – hang or prop something big in the centre, which you can then either style up with stuff underneath or not depending on the look you want to achieve.Like the image below – it can be as simple and as beautiful as this! A lot of people go down the matchy route on mantles. Personally I would try and avoid matching say two candlesticks either end that sort of thing – its easy but the trouble with stuff thatâs easy is that it reads as boring. I’ve got a big mirror above mine and then a ton of objects underneath all at different heights it reads like this: big vessel of flowers, ethnic vessel (no flowers), blue vessel (no flowers), 3 t-lights layered in front of each other, gold head, pelican lamp, stone head! DONE. I’m off to the store we have a new delivery of amazing things in and after I’m done I’ll be sneaking a few home for moi includingÂ beautiful throws, some vibrant yellow cushions. great big tribal looking rhino heads, oh andÂ ornate long mirrors, not to mention our next delivery of flowers – which turn up sometime today! How I am going to everything back in a cab is a different problem! This is a really cool idea for a fireplace. Thank you for sharing this blog. I also want to share this idea I read from https://renovationsbyhearthandhome.com/home-renovations-calgary-kitchen-bathroom-unexpected-beginnings-and-endings/.